You buy a card PlayStation Store recharge 5500 rubles in the form of a SINGLE CODE. Instant receiving code as text. ADDITIONAL DISCOUNT for feedbacks and regular customers, please contact via private message. 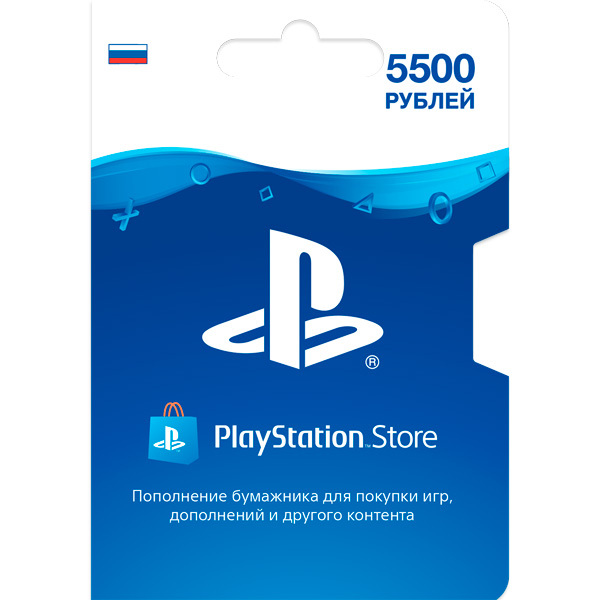 Payment card PlayStation Network 5500 rubles Russia (RUS). A PSN payment card of 5500 rubles allows you to replenish the balance of a virtual PlayStation Store wallet for 5500 rubles. My contacts Telegram and email are on the page "Information about the seller and its products". For any questions you may contact me through these contacts or in a personal message here on the site. 3. Select the “Redeem Codes” item (on PS VITA, click on the “Parameters” icon at the bottom of the screen). ATTENTION!!! This PSN card is 5500 rubles only for RUSSIAN (RUS) accounts, the wallet currency must be RUB !!! Successfully activating the code, please leave a positive feedback.